by Chris Woodford. Last updated: January 27, 2019. When a car screeches round a bend at high speed, the only thing that stops it skidding is the friction between its tires and the road—a force that can be several times greater than its weight. Here friction is working like a kind of glue that sticks the car to the road, but it's not always so helpful. Under the hood, friction is busily wearing out the engine parts—it's one of the main ways that a car wastes energy. That's why we need lubricants: substances that fight friction and allow moving machine parts to slide past one another more smoothly. Photo: Lubricants crop up in some unusual places. 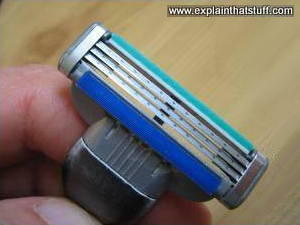 Safety razors like this usually have some lubricant on them so they move easily over your face. The lubricant is the green strip at the top. When the razor gets wet, it turns into a greasy cream that makes it glide more smoothly over the hairy skin that's heading toward the blades. Friction is caused by forces between two things when they touch, like when you drag your foot along the sidewalk and feel and hear the surfaces scuffing together. It doesn't matter how smooth things look or feel—peer at them under a microscope and you'll see they're always rougher in close up. When you drag your foot on the ground, the jagged bits on the two surfaces snag against each other, slowing you down and stealing your energy. For something like a machine with moving parts that rub against one another, friction can be a real nuisance: the rougher the touching surfaces, the more friction there is, the harder the machine has to work, the more quickly it wears out, and the more energy it wastes. Artwork: Friction has its uses. Without it, walking would be impossible: your feet wouldn't grip at all, and you'd slide all over the place—just like you do on ice. 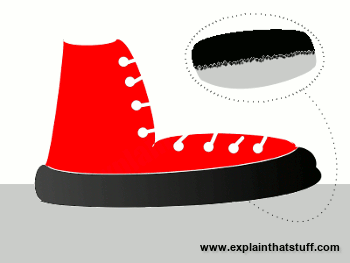 When you put your foot down to walk, the rough lower surface of your shoe grips the rough upper surface of the sidewalk, stopping you from slipping backward. That helps you push back with your leg to move your whole body forward. The same thing happens when a rubber car tire touches the road: the tire stays still on the road while the wheel turns on its axle and moves the car forward. Friction also happens because of a microscopic "gluing" effect when two things touch. When a gecko climbs a wall, millions of tiny hairs on the base of its feet are touching the wall at the same time. Molecules on the tips of each hair attract to molecules on the outer surface of the wall with a microscopic amount of what's called van der Waals force—a really weak kind of electromagnetism. Although each hair provides only a smidgen of magnetic force, there are so many hairs on the gecko's foot that, together, they can provide enough force to support its weight. Read more about this in our article on adhesives. Photo: What makes ice slippery? 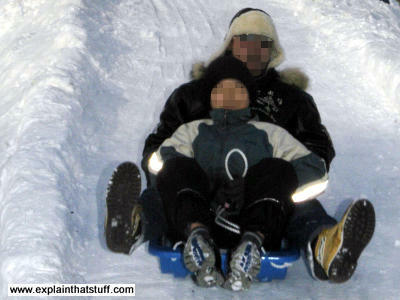 Scientists used to explain it this way: as you move over the ice, you compress it and make it melt, creating a smooth, wet layer that acts as a lubricant, helping you slide over the otherwise rough surface. Unfortunately, that attractively simple explanation has now been called into question—and one current theory is that ice is slippery because it has a permanent lubricant coating that grows thicker or thinner according to the temperature. Whatever the answer, a question like "Why is ice slippery?" can be explained in many different ways, at many different levels of complexity, as Richard Feynman points out in this excellent video. Photo by Chantel M. Clayton courtesy of US Navy. So friction is sometimes useful and sometimes a nuisance—and what we really need is the right amount of friction in the right place, at the right time. Controlling friction is what lubrication is all about. How does a lubricant work? There are hundreds of moving parts whirring away in your car's engine and gearbox. Sometimes it can feel like you're driving a clock! The pistons pump up and down in the cylinders, the crankshaft spins, the gears race round at top speed. Every one of these things rubs against something else as it moves—making noise, losing energy to friction, and gradually wearing out. The way to reduce friction between two moving parts is to lubricate them (coat them in oil)—but how does lubrication actually work? Solids are materials that have a built-in resistance to changing shape, whereas liquids can flow. Think of the difference between ice (which just sits there in a lump) and water (which flows easily as you pour it). If you put a liquid like oil between two solid gears, it will shift about and change its shape as much as it needs to, cushioning the microscopic bumps between the gears as they mesh together and reducing the friction between them. This little illustration shows you what's happening. On top, you can see two unlubricated surfaces (maybe they're the teeth of two meshing gears) moving roughly past each other, slowed down by friction. They might look smooth to your eyes, from a distance, but they're rough at an atomic level and one surface drags horribly against the other, wasting energy and wearing out the materials (1). At the bottom, we can see how a lubricant helps in two different ways: it smooths and cushions the bumps between the two surfaces (2). Also, because it's a liquid, it can easily change shape and flow. Ideally, it will flow in perfect layers, as shown here, in what's known as laminar flow. 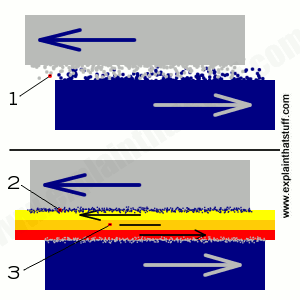 The layer of lubricant near the top surface will move toward the left while the layer near the bottom surface will move toward the right. The layers will slide freely past one another, so helping to reduce friction (3). Although some lubricants (like the slim strip on the razor in our top photo) are used at reasonably cool and constant temperatures, many have to work in engines and machines at very high temperatures. Car engines use thick, syrupy oils for lubrication because these stay liquid at over 300°C (570°F), which is hot enough to survive the kind of temperatures that engine parts heat up to. Water would quickly evaporate and turn to steam in those conditions but it also makes metal parts turn rusty, so it's not really a good choice for a lubricant. Often, lubricants have to work well at a range of temperatures. For example, in a chilly country like Iceland or Switzerland, car axle lubricants need to do their job both when the car is just starting from cold and when it's been running for a while. In practice, that could mean a wide range of operating temperatures from −10°C to 100°C (−14 to 212°F). Lubricants are much like any other substance: the colder they get, the harder, more solid, and less fluid (more viscous or "treacly") they become. Sometimes, that means they work less effectively: the poorer performance of lubricants at lower temperatures is one of the reasons why engines and transmissions are less efficient before they've properly warmed up. Photo: Viscosity: As the operating temperature of a machine rises, a lubricant's viscosity falls: it becomes thinner and more runny. With a big enough temperature rise, the viscosity of a heavy oil or grease could change dramatically, from high (that of treacle or peanut butter), through medium (wood glue), then medium-low (liquid soap), to very low (water). For some machines, thicker and more viscous lubricants will be more effective than thinner and less viscous ones; for other machines, the opposite might be true. Photo: Two different approaches to lubrication. 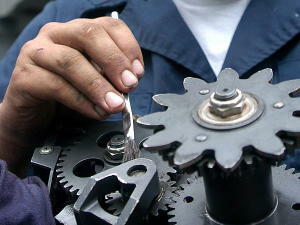 1) Applying thick grease will keep these gears turning for a few more weeks or months. Photo by Angel Roman-Otero courtesy of US Navy. 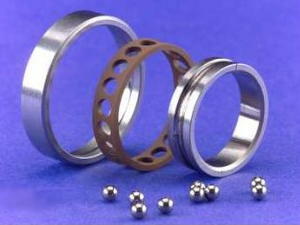 2) Ball bearings like these help to reduce friction in moving machine parts. There's an outer metal ring fastened to one part of the machine and an inner metal ring fastened to another part. The two rings are separated by a circular collar (here colored reddish-brown) with holes inside it. The collar can rotate freely on metal balls that rest in the holes. Bearings are usually lubricated to keep them running smoothly. Photo courtesy of NASA Glenn Research Center (NASA-GRC). How do self-lubricating machines work? Artwork: A self-lubricating differential gear developed by engineer J. Arthur Nyland for the General Motors Corporation in the 1950s. 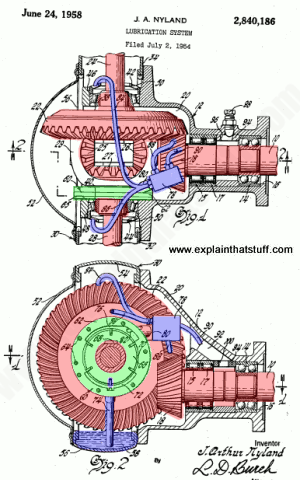 You can read more about it in US Patent #2,840,186: Lubrication System. Artwork courtesy of US Patent and Trademark Office. You have to keep machines lubricated if you want to keep them working. The only trouble is, we expect most machines to go on working all the time. Every minute that a factory machine is stopped for maintenance is a minute of lost production that costs money. Some machines keep on working month after month with no downtime at all. They simply never stop! And it's not just machines that suffer from this problem: if you own a car, you don't expect to have to stop it every few miles to squirt oil into the engine and gearbox. How, then, can we keep our machines oiled up and in tip-top shape? Lots of complex machines are designed to lubricate themselves automatically—and here's a common example. The diagram you can see here shows two different views of the differential gear from a car (the gear at the back that connects the propeller shaft, taking power from the engine and gearbox, to the rear axle and the back wheels). The top picture shows a plan view (looking down from above) while the bottom picture shows a side view (as you'd see staring from the side of a car at one of the rear wheels). I've colored the gear wheels red and you can see how the differential essentially converts spinning movement in one direction (along the length of the car) into spinning movement at ninety degrees (along the width of the car). This particular differential was designed by J. Arthur Nyland for General Motors in the mid-1950s. Apart from the gears, you'll see two other key components that I've shaded green and blue. The green areas show a fluid pump that's driven by the red gears. As the gears spin, the green pump spins too. That makes it draw up lubricant from a reservoir (blue), which is then pumped out through narrow pipes onto key parts inside the differential gearbox. The entire differential unit is sealed and, as the gears spin at high speed, any excess lubricant is thrown off, eventually dripping back into the reservoir for reuse. Adhesives (glues): An adhesive's job is exactly the opposite of a lubricant's. Engines: An overview of different types of engines. Hydraulics: The "liquid muscles" that power cranes, backhoe diggers, and other machines. Metals : An introduction and overview. Lubricants and Lubrication by Theo Mang and Wilfried Dresel (eds). Wiley-VCH, 2017. A hefty two-volume encyclopedia covering (among other things) different kinds of lubricants; their use in engines, hydraulics and compressors; testing in the laboratory; and environmental impacts. Friction, Wear, Lubrication: A Textbook in Tribology by K. C. Ludema. CRC Press, 1996. Research Promises Better Lube for Nano Machines by Saswato R. Das. IEEE Spectrum, April 14, 2010. How can graphite (and graphene) lubricate nanoscopically tiny machines? What's Inside WD-40? Wired, June 21, 1999. A closer chemical look at the (mostly petrochemical) ingredients of the popular lubricant. Old Macdonald's Motor Oil by Reuters. Wired, June 21, 1999. Can you really lubricate an engine with renewable, biodegradable, and environmentally friendly vegetable oil? Lubrication in space age by Barnaby J. Feder. The New York Times, June 25, 1981. This old (but still fascinating) article from the Times archive explains the challenges of lubricating mechanisms in space. Society of Tribologists and Lubrication Engineers: US-based organization for professionals.